Eighty years ago, “H. Stanley Todd” was nearly a household word. His paintings drew thousands of people. Parisian-trained, he was a member of New York’s prestigious National Academy of Design. He was also a steam engineer who, by the age of 44, rose to the presidency of the Universal Turbine Company. At the height of his corporate career, he and his wife, Jean, bought a 102-acre estate on Long Island, New York, The Priory. There, Todd returned to painting. Though Todd was nearing 50 when the United States entered World War I, he enlisted. He served in Military Intelligence in Washington and Europe and earned a Silver Cross. At war’s end, he remained abroad as a staff member to the Commissioner of the American Red Cross. He spent eight months working specifically on behalf of war orphans. In 1924, the French government honored Todd as a Chevalier of the Legion of Honor. In 1932, Todd returned to Long Island. The following year, he painted Christ, The Nazarene. According to the reviews of the day, previous contemporary paintings of Jesus depicted a dark-featured effete saint. Todd painted a blond-haired, blue-eyed masculine figure. Almost with the force of a magnet, the representation attracted American Christians. 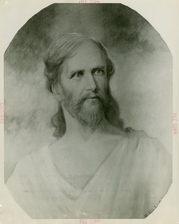 Prints of the portrait were so popular that religious leaders convinced the artist to hold a special sunrise service at estate on Easter Sunday 1933 to celebrate the 1900th resurrection. Church congregations arrived by bus. The Long Island railroad added a pre-dawn train. Four trumpeters heralded the rising sun. A 200-voice choir sang Handel’s Messiah. Ministers from Long Island, Brooklyn, and Manhattan delivered sermons. At the end of the service, the audience lined up outside Todd’s studio to view The Nazarene. That summer, the painting hung in the Hall of Religion at the Chicago World’s Fair. When the fair closed, The Nazarene traveled to 30 different churches across the nation. Why was such a popular artist forgotten? When Henry Stanley Todd (1871-1941) sought artistic training, he chose the best school in the world, the Académie Julian in Paris. Leading the school was the man who dominated the Parisian art world, William-Adolphe Bouguereau (1825-1905). Bouguereau demanded photo-realistic idealized representations according to the “academic principle of enhancement,” that is, “smoothing out any defects in the model, endowing the human figure with classical authority.” His style sometimes led to cloying sentimentality. The Impressionists detested his work. Todd studied, not with Bouguereau, but with Jean-Paul Laurens (1838-1901) and Jean-Joseph Benjamin-Constant (1845-1902). From them, he learned impeccable draftsmanship and anatomical accuracy. Laurens was a history painter known for dramatic use of architectural space. When Benjamin-Constant painted portraits, his subjects gazed unflinchingly at the viewer. In Todd’s portrait of Abraham Lincoln, he demonstrated the best of his training, but also displayed his American penchant for truth. His Lincoln is not an idealized representation, but a realistic portrait based probably on an 1863 photograph by Alexander Gardner and one from 1864 by Anthony Berger. Jean-Joseph Benjamin-Constant, Judith, N. D.
Throughout his life, H. Stanley Todd painted portraits of business leaders, politicians, and religious leaders. His subjects included William McKinley, Theodore Roosevelt, Abraham Lincoln, and Mary Baker Eddy. Todd’s work hangs at the National Academy of Design, Columbia University, and Williams College. He died April 21, 1941, and was buried with full military honors at Arlington National Cemetery. Todd studied and worked during Impressionism’s quiet swell. After his death, an avalanche of modernity plunged even the finest of traditional representational art into oblivion. Add Todd’s antiquated religious affiliations and Memory refused to mention his name.